Dexter Daily: Charlotte Rampling: "I Think the Revealing Will Make People Quite Surprised, Which Is the Whole Point"
Charlotte Rampling: "I Think the Revealing Will Make People Quite Surprised, Which Is the Whole Point"
via Huffington Post: Dexter Season 8 special guest star Charlotte Rampling knows when the role is right for her. It just so happens, that's the feeling she got when her current gig on "Dexter" was offered to her. "[I]t just felt completely, fantastically right," Rampling, 67, told The Huffington Post in a phone interview. "They called me I think six weeks before or something. I didn't know the series, but I watched it, found out about it, then I was pitched the subject by Scott Buck, the producer, and it all just sort of fit in. It was just one of those things that you know is the next right move." Rampling has more than 100 film and TV credits spanning from early work in the 1960s to her current arc on "Dexter." She's worked with everybody from Woody Allen to Kirsten Dunst. It's her extensive resume that makes her the latest subject for The Huffington Post's "Isn't That ...?" series on character actors. Rampling began her career as a model, but soon transitioned to acting. Her first onscreen appearance was an uncredited role in "The Knack ... And How to Get It," and not "A Hard Day's Night." The actress said there's no truth to the rumor she appears as a dancer in the film. In 1966, she started in "Georgy Girl" as Meredith, which she said is one of her favorite roles. Other favorites include "The Damned" and "The Night Porter." Rampling has worked steadily since the '60s, but there are a few key films that she is continually recognized for. "Film-wise, I'm recognized for 'Night Porter' and for 'Under the Sand,' 'Swimming Pool' and for 'The Verdict' and 'Max, My Love,'" she said. "In America, it's not so much. It's for 'The Verdict' and some other things. I've made quite a lot of films that would not be released in America." Read the rest of the article after the jump. Most of her credits are for English and French films, but Rampling doesn't discriminate between film and TV. "[I]f the work is good, there's no difference now. Maybe before there was the thought -- and it was true -- that television was a bit inferior. You didn't have such long schedules and the scripts weren't so good. Now there's a great talent in television, especially in the writing. If the work is good, if it's on television or film, it doesn't make any difference now," she said. "Dexter" is arguably Rampling's most high-profile American TV gig -- she starred in "Restless" on Sundance Channel in 2012 and scored a SAG nomination -- but she's not eying other TV projects at the moment. "I don't have my eyes on things," she said. "I wait to be surprised. It seems that, up until right now, people have come in and surprised me and I've gone off and had a little adventure. I don't predict anything. That's not the way I am." Throughout her career, Rampling seemed to gravitate toward certain roles, but she said she doesn't think she's been typecast as a villain. "I like playing bad people," she explained. "I like playing mysterious, bad people. They're great fun to play. I've got the kind of face that goes with it. That's also what seems to come out -- a certain sense of danger. That's not necessarily who I am, it's what I project ... You're cast for what you project ... People like to know [about other people] because everyone thinks they're transparent. You want to know everything about people because you're a journalist and film people always want to know everything -- 'Is he that?' -- but what actually is important, obviously, is what emanates from an actor and what he projects and what he vehicles -- the multi-layered dimension that he can put into a character to make it interesting." The actress said she felt the current "Dexter" gig "just slipped into the family" of characters she has in her repertoire. "Dexter" producer Scott Buck didn't give her a script, but instead, pitched her the role over the phone. "It just felt very familiar and sort of, in that way, exciting because it was like meeting another member of the family that I wanted to explore more," she said. 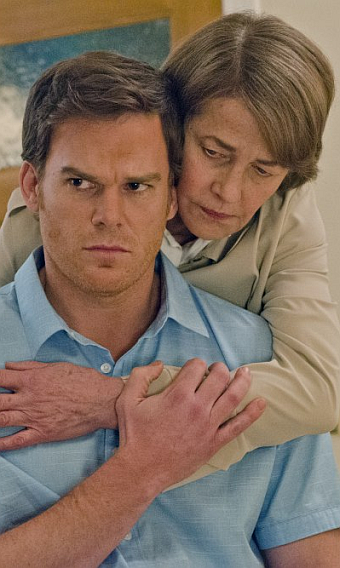 "It sort of felt quite familiar, the whole thing ... My relationship with Michael [C. Hall, who plays the titular Dexter Morgan] ... There was something very familiar about him. It was almost as if I had known him before in another life. Sometimes you feel you met someone before, but you actually haven't." Rampling said she hadn't seen the series before joining the cast. There was something about Dr. Evelyn Vogel, the woman who helped Harry Morgan (James Remar) come up with the code for Dexter to kill by, that appealed to Rampling. There are secrets to the character that viewers will start to see unraveled. "That's the kind of stuff I like playing -- those multi-layered things. I know that's good territory for me. I do that well and so, if you get the opportunity to do things well, you feel like a horse sort of jumping certain heights. I know there are certain things that are challenging for me that I know I can do well," she said. "This is a role that I found in that way challenging because I didn't know how she was going to end up, so that's what was really interesting. You find that out actually as you go along, but I didn't know what the final outcome would be. That intrigue is good, because you don't normally in real life know what [is going to happen to you] -- usually, unless you have some kind of sickness that you know you're going to die from, but with accidents or things that are going to happen, you don't really know." Rampling said viewers will be surprised about what's to come with her "Dexter" character. "A lot of questioning will be going on at the moment because not much is being revealed. A lot has been put in place and a lot has been said, but nothing has been actually revealed. The revealing comes much later, which is actually very fascinating and will, I think, make people quite surprised, which is the whole point," she said with a laugh. When Rampling wraps projects, she said she usually takes something with her. "On a film, when you finish you can take a piece of clothing that you like. That's what I usually do," she said. "I keep them like characters in the cupboard. They haven't actually got anybody in them anymore, but they're sort of hanging there."